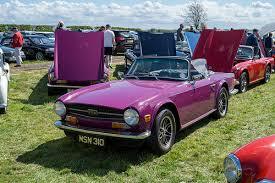 The TR Register will have a stand at this years Stirling and District Classic Car Club Charity Show, which will take place on Sunday 12 May 2019 at Strathallan Games Park, Bridge of Allan FK9 4QY. As with the last four years Stirling and District Classic Car Club are hoping to attract an entry in the region of 600 cars plus additional motor cycles, military and commercial vehicles. The usual trade stands, children's rides etc. should also be attending.